In 2011, the 360 commercial ports of America, alone, took-in goods worth $1.73 trillion. There are more than 100,000 ships at sea, carrying between 12 and 110 crew members. Each laborer signs-on for contracts lasting 4-6 months. And while many of the sailors have families at home—be it Germany, Panama, The Philippines, or somewhere in between—they need to keep in touch with expensive satellite phone calls and with limited access to email. Shore-leave time dwindles at just a few hours, giving them little ability to even set foot in the countries where they deliver their precious cargo. And their view through a porthole window always replays the same footage of the middle of the ocean. Ms. Deffaa imagined creating a high-performance, low-bandwidth communications network that could transmit and receive data through satellites to give these sailors access to programming, products, services, and most importantly, social media. That’s where ERA404 came in. In May, Trident Networks hired ERA404 to scope the entire project and draft the initial database architecture for what would soon be called Seamate. A project’s scope is a finely granular blueprint that incorporates every function, every screen, even every checkbox in the project. ERA404 then uses this scope to develop a strategy for the project’s execution. “We worked with Ms. Deffaa over a period of six weeks and ultimately created a massive checklist of all the design, development, and infrastructure that would be needed to bring her idea to life,” said Citarella. Following the concepting of the back-end architecture, Trident returned to ERA404 to assist with front-end strategy and design. Seamate v1.0 would incorporate eight different sections, including: Social, Messages, Videos, Music, Pictures, Games, Cards and an online ecommerce system. ERA404 worked with Trident to create the strategic user interface/experience (Strategic UI/UX) and design the interface (Creative UI/UX) for all eight sections. Working closely with Trident’s team of developers, ERA404 worked through the scope to build-out the Social section, complete with instant messaging, jobs and status updates. “We looked at the things that popular social networks were doing well and thought about how our audience could benefit from each of these, with the restrictions of limited satellite data in mind,” said Citarella. The resulting interface incorporates clean, fluid, modular design that color-coded iconography for each of the sections of Seamate. System messages are coded through language files with international web fonts and scalable dimensions and resolutions. 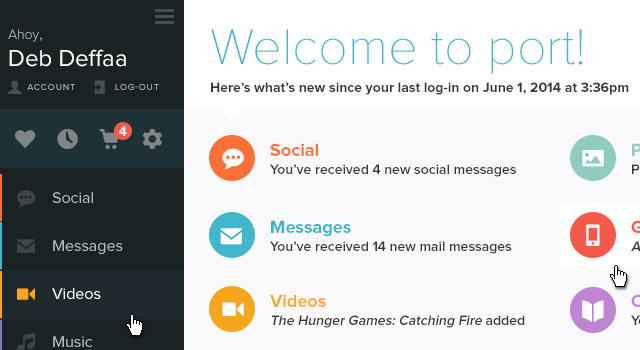 As each user connects to the system, it customizes itself based on their devices and their preferences. ERA404 has signed a retainer to work with Trident through the development of Seamate’s marketing and promotional campaigns and a host of new features for v1.1.